An analysis of data recently provided to the parliament’s Public Accounts Committee by different ministries show that ten months later, the government has settled only Rs 29 billion, showing a progress of merely 23 percent. The spent amount of Rs 101 billion is yet to be settled. This means the amount, equaling the money required to build Kathmandu-Tarai Expressway, remains either misappropriated or lacks supporting documents. Such inaction from the government comes at a time when Prime Minister Khadga Prasad Oli has assured the country of good governance and corruption-free government. Slackness in settling those unsettled accounts provides leeway for the public office bearers to spend without due process or even misappropriate money, lawmakers said at the PAC meeting on Thursday. A total of Rs 33.55 billion spent by Ministry of Physical Infrastructure and Transport and its agencies were unaccounted by the OAG. The ministry was asked to settle the amount but it has hardly settled 12.39 percent, leaving Rs 29.39 billion unsettled, according to the PAC record. Likewise, Ministry of Education, Science and Technology; Ministry of Federal Affairs and General Administration; and Ministry of Finance were yet to settle Rs 24.44 billion, Rs 15 billion and Rs 8 billion, respectively. The PAC has started discussion with concerned officials in order to exert pressure on the ministries to settle their accounts immediately and maintain financial discipline. 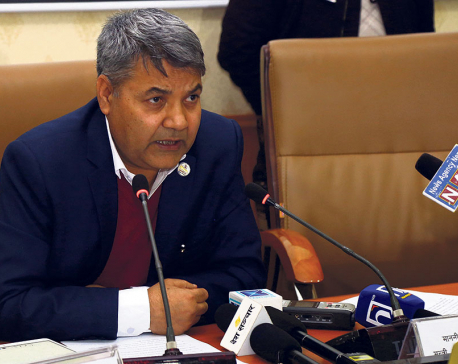 Lawmaker Birodh Khatiwada criticized the secretaries of different ministries who had briefed the committee about the unsettled accounts, stating that the secretaries lacked concrete vision and plan to reform the system of spending public money. “The slackness in settling unsettled accounts shows financial indiscipline is growing rapidly in the public offices, and this has posed risks to the governance system,” PAC Secretary Roj Nath Pandey told Republica. The PAC has suggested recovering the accumulated amount of Rs 100 billion from different individuals and entities into the government accounts. 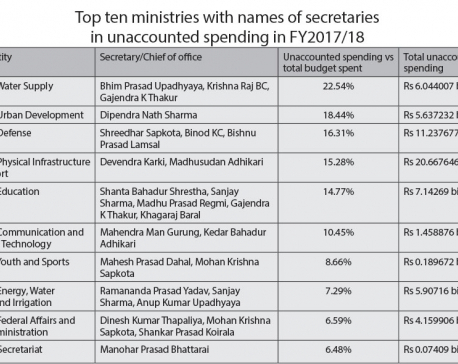 Two weeks ago, the committee had demanded a list of the officials and entities along with the amounts they needed to pay, but the Ministry of Finance has not yet provided the list, according to Pandey. The accumulated government revenue to be recovered is in tune of Rs 40 billion, according to the OAG statistics. The PAC has a plan of inviting public enterprises to discuss on the matter and enforce timely auditing of income and expenditures of those organizations.